How is the foreclosure process in Spain? Foreclosure laws in Spain are more stringent compared to most other European countries. If you default on your mortgage in Spain, you do not only lose your home but also all your present and future assets. It means that if you are not able to pay mortgage installments, your lender can seize your bank accounts and other assets like your car. If the lender couldn’t recover the outstanding mortgage after foreclosing on your home and taking movable assets, you will still end up owing the bank. Some others measures that lenders can take to recover the debt include the seizure of payroll, pension or salary of a defaulter. There have been cases where people had to work for the bank to pay the outstanding amount after foreclosure. The extent of the liability is unlimited and personal. If a borrower fails to pay three monthly mortgage installments, he or she falls into ‘technical default’. Prior to that, the lender tries to recover missed mortgage payments and settle the loan out-of-court. After three months of missed mortgage payments, the lender’s debt collection branch starts the foreclosure process. It files an ‘Executive Procedure’ with a local court against the property. After filing the Executive Procedure, the lender gets a Notary Public to send a registered letter (called a notice of default in the U.S.) to the borrower. It usually happens from 2 to 3 weeks after the borrow falls into a technical default. The letter informs the borrower that a repossession procedure has been initiated. The court fixes a date for the trial. The borrower is informed again at the start of the trial that his home is under foreclosure. The Land Registry submits a report to the court on charges and liens against the property. The value of the property is appraised on the basis of either the Land Registry records or an updated appraisal carried out by the lender. The estimated value is used for determining minimum bid price or reserve price in the public auction. It usually takes up to 12 months for a public auction to occur. The judge sets a date for the public auction. The minimum bid price can’t fall below 75 percent of the appraised value of the property. However, if no-one bids and the gravel falls, a lender is legally entitled to seize the property for 60 percent of its appraisal value. If the lender couldn’t recover the debt after the auction and all the associated repossession expenses, the lender has the right to seize the rest of the borrower’s assets, even if the assets in question are located abroad. If there is a guarantor on the mortgage deed, the bank will be entitled to seize even their assets. The only way a borrower can halt foreclosure is by paying the outstanding amount plus the full associated repossession expenses before the court sets a date for trial. Lenders also encourage distressed homeowners to sell the property before the legal process of foreclosure begins because judicial auctions may not attract many buyers, resulting in award price being much below the property’s appraised value. The Spanish government has provided some relaxations to vulnerable homeowners from time to time. It suspended evictions for two years for those with small children, the disabled and the long-term unemployed. It also announced partial debt forgiveness for some defaulted borrowers who pledge to repay a certain amount of the remaining debt within five years. However, no concrete measures have been introduced to change the stringent foreclosure laws. 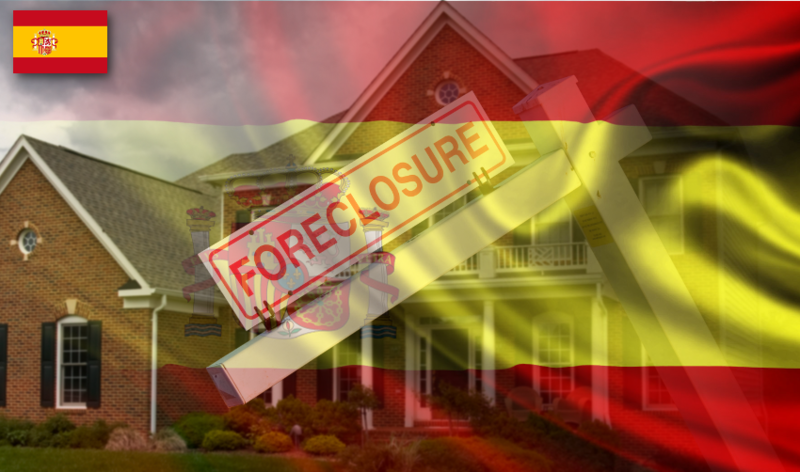 How foreclosure laws in Spain differ from those in the U.S.
Eviction is the only outcome if you default on a mortgage in Spain. You can short sale or file for bankruptcy in the U.S. to avoid foreclosure. The extent of the liability is unlimited and personal in Spain. It means that you will owe the bank if they were not able to cover the outstanding debt after a public auction. They will seize your bank account, salary, car, furniture and other assets. In the U.S., a lender can get a deficiency judgment against a borrower if foreclosure didn’t cover the debt, but there are ways to prevent banks from securing a deficiency judgment. Lenders can only foreclosure a home and can’t touch a borrower’s other assets. Foreclosure process is judicial in Spain. It’s judicial in some states in the U.S., while non-judicial in others. Spanish courts can’t delay or freeze the eviction of home buyers who have fallen behind on their mortgage payments. The U.S. courts can delay or even stop foreclosure in extreme cases if there are loopholes in foreclosure proceedings. Foreclosure laws are state specific in the U.S, while they are federal in South Africa. There had been several protests against the century-old Spanish foreclosure laws. Thousands of evictions were reported every year after the 2007-08 global financial crisis. Soaring unemployment and the collapse of Spain’s debt-fuelled housing bubble added to the woes of home buyers, who are frequently saddled with unaffordable debt and exposed to the threat of eviction. Suicides by evicted homeowners have also hogged headlines from time to time.